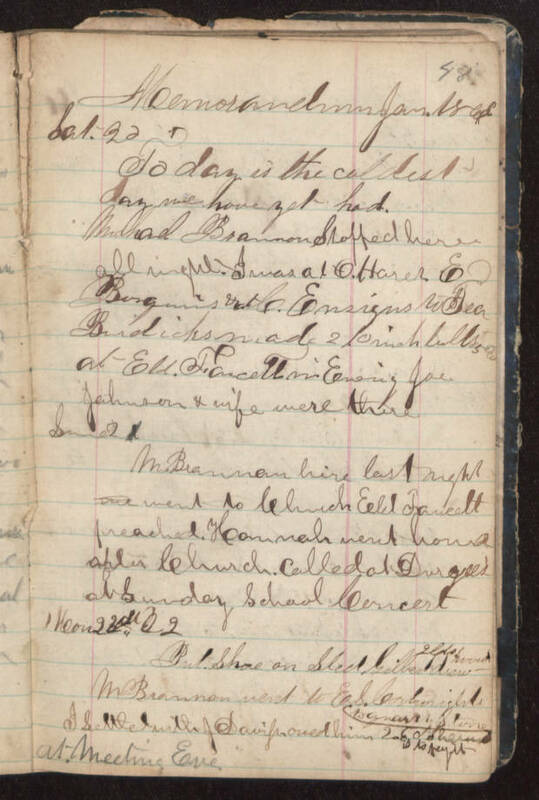 Memorandum Jan. 1866 Sat 20 To day is the coldest day we have yet had. Micheal Brannon stopped here all night. I was at O Hares E Burguins & at C. Ensigns to tea Burdicks made 2 10 inch (illegible) at Eld Faucett in evening Joe Johnson & wife were there Sun 21 M. Brannon here last night we went to Church Eld Faucett preached. Hannah went home after church. Called at Duryees at Sunday School concert Mon 22 Put shoe on sled Gilbert drew 2 lds (illegible) M. Brannon went to E. S. Cartrights I settled with J. Faviss owed him 2.60 [illegible] at meeting eve.